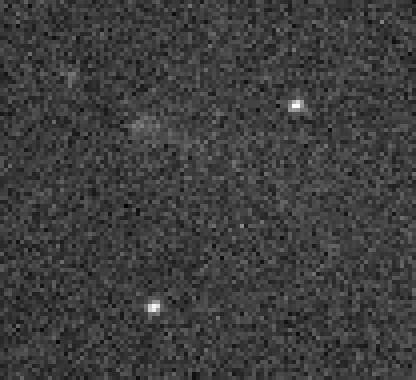 This is an enlargement of a single 30 second exposure (start time 2003 Jul 31 00:51:00 UT) used in the 15 image stack, covering an area of 150" x 140". Each pixel is 1.5"x1.5" and the coma appears to be about 10" in diameter and without condensation. Ideally the position should be measured to an accuracy of better than 1". 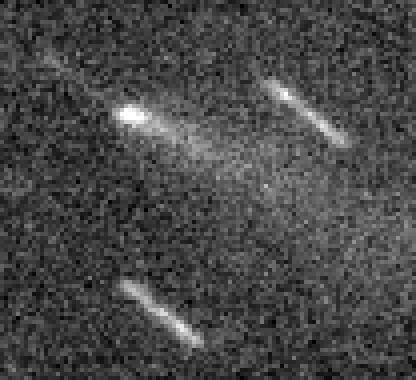 It shows how diffuse the coma is and probably why a lot of the early astrometry of this comet shows large residuals. By stacking more images the coma becomes more defined and the accuracy of measurement improves. The enlargement of the 15 image stack (below) shows how much more defined the central region becomes with the extra signal.